Since 2010, I’ve been using Edovia’s Screens for all my VNC needs: an elegant client with a polished interface and just the right amount of options, I’ve always been a fan of Edovia’s focus on elegance and simplicity combined with touch controls. The iOS app has changed quite a bit over the years: notably, with iOS 7 Edovia took the opportunity to completely redesign Screens with a cleaner UI and updated gestures, adding on-disconnect actions, hot corners, and trackpad mode with subsequent updates that continued to strike a good balance between feature additions and intuitiveness. I don’t need to access dozens of Macs remotely every day – I only log into my local MacBook Air (when I’m in bed or in another room) and my remote Mac mini – but I know that Screens for iOS has everything I need. Screens 3 is Edovia’s latest update to their Mac client, originally released in 2011. A free update for existing Screens 2 customers, Screens 3 is available both on Edovia’s website and the Mac App Store at $34.99, but only the Mac App Store version can offer iCloud sync across devices; because of this limitation, I recommend buying Screens from the Mac App Store. 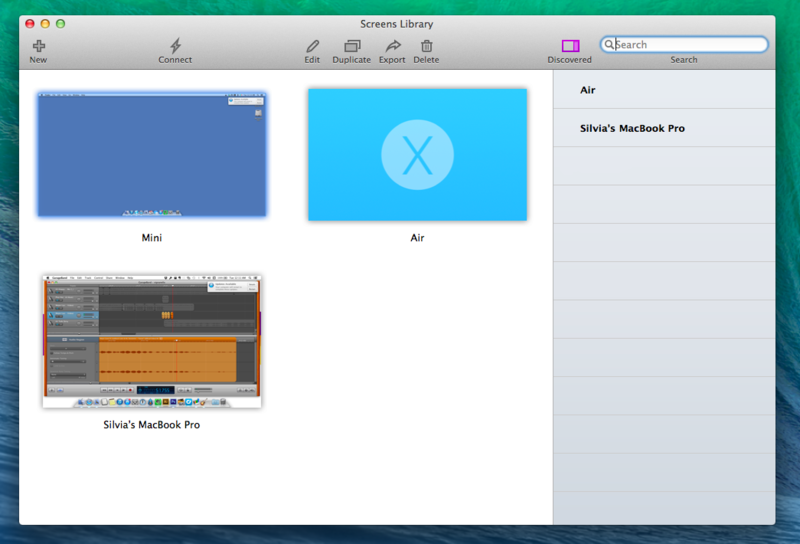 Version 3.0 of Screens for Mac is clearly inspired from its iOS 7 counterpart, which is a good change from the old app. Skeuomorphic backgrounds and textures are gone to leave room for a cleaner dashboard that displays large thumbnails for your configured remote computers; this window can be resized, and the thumbnails will change accordingly. The Screens Library may not be the most original design ever created for OS X, but it’s functional and makes it easy to distinguish computers at a glance: especially if you keep a different background on each machine and use large thumbnails, you’ll instantly know where you need to double-click to connect. With a new sidebar on the right, you can also initiate single-shot connections to computers discovered nearby, which is handy if you want to connect to a machine without adding it as a screen with full settings and other options. I don’t happen to work in an office environment where this option could be useful with multiple local machines, but I’ve been using it to quickly fix problems on my girlfriend’s MacBook Pro at home, and it worked as advertised. Even for single-shot connections, Screens can save credentials in the OS X Keychain, so you can avoid typing usernames and passwords every time without having to add a computer to the Screens Library. Two of my favorite changes in Screens 3 are features that mostly work outside of the main app, and they’re both meant to speed up access to your remote computers through Screens. Over the years, in spite of wanting to use Screens to connect to my Mac mini, I often ended up right-clicking the Finder icon in my Dock, then “Connect To Server” to quickly jump into VNC. OS X has a built-in VNC client called Screen Sharing, and now Screens 3 can override it by intercepting calls to the vnc:// protocol and directing them to a new Screens connection instead. 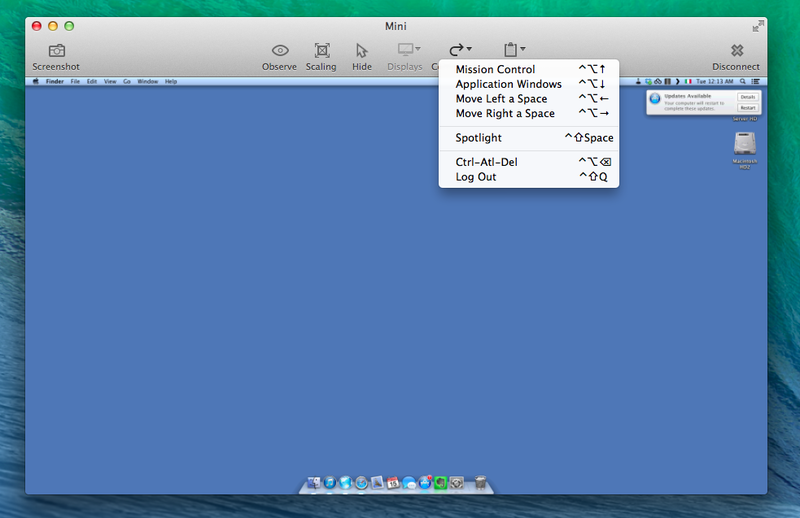 Once activated in Screens > Preferences > General, the option to make Screens your default VNC client will result in the app treating VNC connections started somewhere else on your Mac as single-shot connections (that is, new windows that don’t retain window settings). 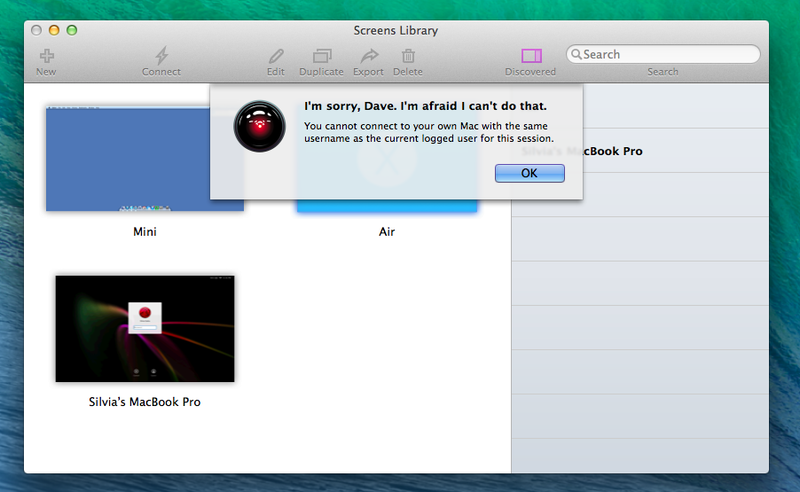 I’ve tested this with the aforementioned Finder method and Alfred workflows, and it works reliably. The second change is a menubar shortcut to quickly connect to recent or discovered computers. This menu makes it extremely fast to reconnect to computers you’ve already configured in the Screens Library (which keep your preferred window size, don’t open the Screens Library when launched, and even show a small inline screenshot), but I wish it worked like a background agent – the main Screens app needs to be running for the menubar icon to show up. From a technical standpoint, Screens 3 (synced with Edovia’s Screens Connect service) is faster than its predecessor: according to Edovia, Screens has been rewritten to take advantage of the latest technologies in OS X Mavericks, and in my experience the app has been fast, responsive with my not-so-great DSL connection, and on par with the iOS counterpart. iCloud sync provided a big advantage in starting to use the app for the first time: coming from Screens for iOS, I launched Screens 3 on my Mac and found all the computers I had configured on my iPad with their old preferences, waiting for me to re-enter their password and connect. This kind of cross-platform app and preference syncing experience is where iCloud excels at, and Edovia implemented it well in Screens 3. During VNC sessions, Screens 3 offers some new welcome options to remove friction from executing actions on remote computers. 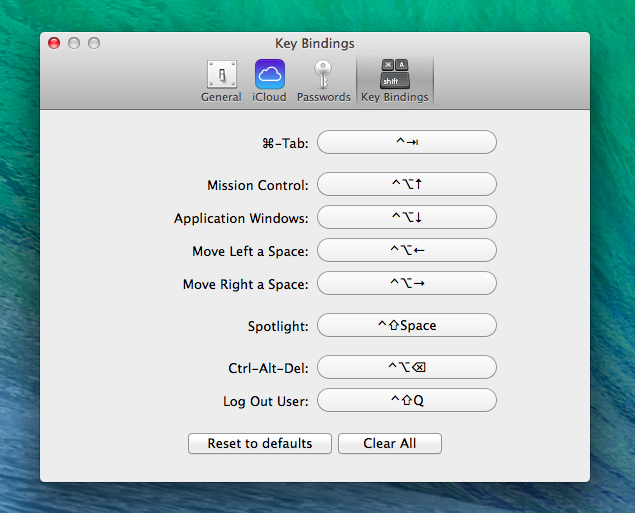 For keyboard users, Screens 3 supports custom keyboard bindings to assign personalized shortcuts to actions such as ⌘Tab, Spotlight, and Mission Control in a way that they don’t interfere with keyboard shortcuts on a local Mac. I like the idea, but I would appreciate an option to mimic the behavior of Apple’s built-in VNC client (shortcuts are the same when the cursor is placed over the connection screen – i.e. ⌘Space shows Spotlight in VNC, not on your computer). Like the iOS app, Screens 3 can perform a specific command upon disconnecting from a computer, with support for hot corner activation, user logout, and Ctrl-Alt-Delete (available in Screen > Edit > More Settings). There are many nice details in Screens 3, and while I don’t want to spoil the fun discovering them, I do want to include a screenshot of what happens if you try to connect to the same Mac you’re using in Screens. What I don’t like about Screens 3 is the way it handles clipboard transfers. In Apple’s Screen Sharing app, you can send your local clipboard to a remote computer and receive it from a computer to set it on your local machine – both options work as expected, setting the system clipboard either on a computer you’re connected to or your current one. Screens 3, on the other hand, doesn’t use a real clipboard transfer for an outgoing clipboard action: the app can send text, but it won’t copy it to the system clipboard on the target machine. Instead, Screens will get text from the clipboard and put it in an active text field without copying it; while this is handy if your cursor is, say, already placed in the Safari address bar because it gets inserted immediately, it is dramatically less convenient if you want to keep text stored in a computer’s remote clipboard to paste it several times across different apps. When you receive the contents of the clipboard (from a remote computer to your local one), the feature behaved as I expected – it’s a real transfer that copies text back into your local clipboard. According to Edovia, clipboard transfers should also work with images, but in my tests I couldn’t manage to copy JPEG images from my remote Mac mini and paste them on my MacBook Air. Screens 3 is a solid update that makes the app consistent with the iOS version, providing a better setup experience thanks to iCloud, faster performance, and the advantages of a Mac app such as fast menubar access, multiple windows, and custom keyboard bindings. Screens’ current shortcomings (window size settings for single-shot connections and clipboard transfers) don’t considerably impact the experience, but I’m looking forward to updates. Overall, Screens 3 brings welcome design updates and features that take advantage of Mavericks for a VNC app that’s versatile, powerful, and a pleasure to use on both iOS 7 and OS X. Especially for people who manage multiple computers with VNC and already own Screens for iOS, Screens for Mac's Library view is superior to Apple’s “Connect To Server” dialog, and the app’s on-disconnect actions can help in automating aspects of remote connections to save time. Screens 3 is available on the Mac App Store at $34.99; a free trial for 10 successful connections is available from Edovia’s website.